Earlier this week I came across a YouTube video showing a Nook Simple Touch running the latest and final version of the FastMode + USB Sound ROM. As the name implies, FastMode helps make the Nook refresh the E Ink screen faster—even fast enough to play videos—and USB Sound adds audio support to the Nook via the USB port, which is something that it doesn’t support normally. According to the developer, the ROM is fully compatible with the Nook Simple Touch and the Nook Simple Touch with GlowLight (it’s not compatible with the newer Nook GlowLight). You can find the download and install directions for the FastMode & USB Sound ROM on this thread at the XDA forums. Playing videos and audio isn’t anything that is new for the Nook Touch, but I still can’t help but be amazed after all these years how many different ways people use Nook ereaders. Plus it’s surprising just how smoothly an E Ink Nook can play videos, especially considering the older single core 800 MHz processor that it uses. 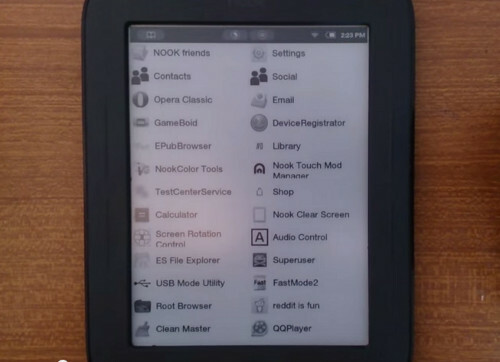 The Nook Touch is proof that that’s all E Ink ereaders need because it’s still to this day the fastest E Ink ereader out there. People are always complaining when new ereaders come out that they don’t have newer, faster processors. Most E Ink ereaders released now come with single core 1.0 GHz processors, and some of the Android-powered E Ink ereaders have dual-core 1.0 GHz (and supposedly 1.2 GHz in a couple cases). None of the Android devices with those faster processors are anywhere near as fast as an optimized Nook Touch, and battery life isn’t as good with them either. Four years after its initial release, the Nook Touch is still one of the most versatile E Ink ereaders out there. It’s good to see that developers are still working on it. In fact a CM11 ROM with Android 4.4 is currently under development. Very cool, thanks for mentioning it. I have an old NST which I can try this out on. Yeah, it’s good seeing the older Nooks sill getting some love from developers, especially since B&N doesn’t seem to care about them anymore. The Nook Simple Touch may not be the latest ‘n greatest ereader model out there but it’s still one of the best as far as I’m concerned. I’ve rooted mine and run Cool Reader to read EPUBs. I have a Google Nexus 10 that I bought primarily for PDFs but the Nook is still my go to ereader. Coupled with Calibre on my PC and I have an excellent ecosystem for ereading. If only there was a way to get rid of those dern Bronte sisters on the start screen! . . needs to be rooted out somehow, but last time I tried I bricked the whole thing. Also, would love the ability to jump ahead when looking for titles of books: if you have 500 books on your Nook, you can only look at the titles one page at a time. Would also love multilanguage dictionary. Oh, and a light . . . There are a few apps. Directly out of a reader app (again, AIreader), I use Aard . Would like to see how sound is generated from the usb port. Where is “system/media/screensaver/authors/Bronte_Sisters.png”? Don’t see it anywhere. When I connect it to my PC via usb it shows me the Nook drive. Then screesavers. I guess your device is not rooted, so you don’t have the rights to see the folder. Interesting. Will take a look at your suggestions. Thanks.